of the moon may be made of material from Earth than previously thought. Scientists have suggested that the moon was created when a Mars-size object named Theia collided with Earth 4.5 billion years ago, with more than 40 percent of the moon made up of debris from this impacting body. However, researchers had expected this alien world to be chemically different from Earth, and past studies have revealed that the moon and Earth appear quite similar when it comes to versions of elements called isotopes, more so than might be suggested by the current Theia model. To compare the moon and Earth further, investigators analyzed isotopes of titanium found in moon and Earth rocks. At first, titanium isotope ratios within 24 lunar samples returned by the Apollo missions to the moon looked different from Earth’s. However, the scientists then corrected their data for isotope-ratio alterations that would result after cosmic rays from deep space collided with the moon. Cosmic rays, which are charged particles that speed through space, can generate neutrons that titanium atoms can absorb, changing their isotope type. As said Study lead author Junjun Zhang, an isotope geochemist at the Chicago Center for Cosmochemistry after this adjustment, lunar titanium isotope ratios proved identical to Earth’s within about 4 parts per million. 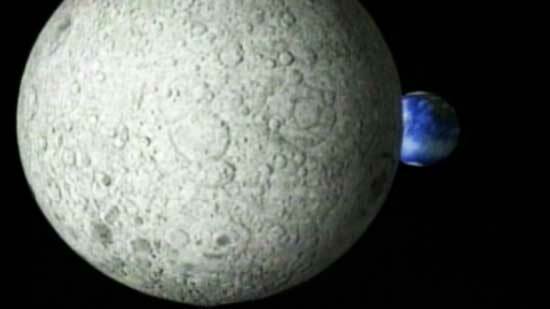 These new findings are further evidence that the moon’s makeup is similar to Earth’s. According to researchers it seems unlikely that Theia would be nearly isotopically identical with Earth, so if Theia were a greater contributor to the moon, the moon should differ more substantially from Earth. On the one hand, the similarities between the moon and Earth might be explained by intense mixing of material after the moon-forming impact, leaving much of Theia’s material buried within the moon. On the other hand, maybe the moon is made almost completely of Earth material that spun off from a rapidly spinning Earth after a giant impact.